BMH is happy to welcome Kelsey Warren (pictured) of Marion, Indiana, as the 2010 summer intern, working full-time in editorial and office assistance work in the BMH offices in Winona Lake, Indiana. Kelsey is a May, 2010, graduate of Taylor University, with a B.A. degree in English literature with minors in English writing and studio art. Her concentration was in new media communication. Kelsey has had extensive publication experience with the art and literature journal of Taylor University, and has worked at the university’s writing center with college students, graduate students, and faculty on their writing. She studied abroad in London, England, in 2007 and she has given a number of presentations at academic gatherings and conferences. 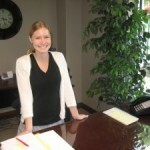 When you call the BMH offices at (574) 268-1122, Kelsey will now be the one greeting you and providing customer service. Welcome, Kelsey! Can't wait to meet you! gladys deloe (wife of editor, Jesse) and author of the LifeTime Learning Curriculum for chidlren in poverty.